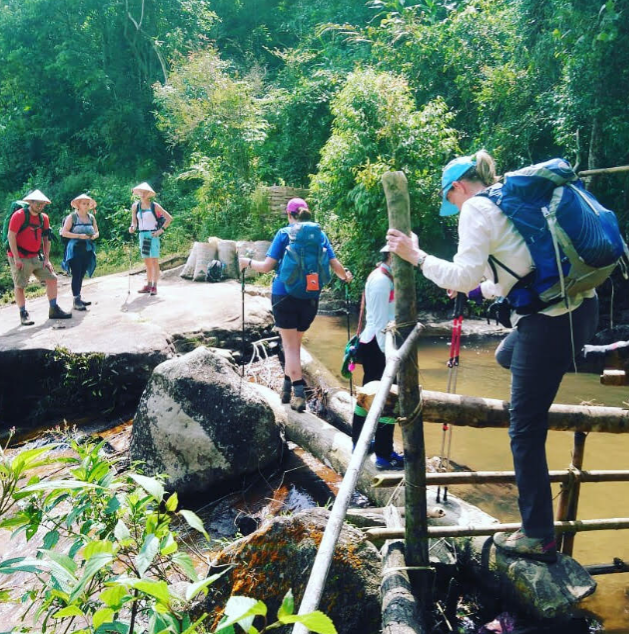 The expedition offers you the challenge of trekking through some of the most beautiful and un-spoilt mountain regions in the world for an amazing taste of South East Asia. 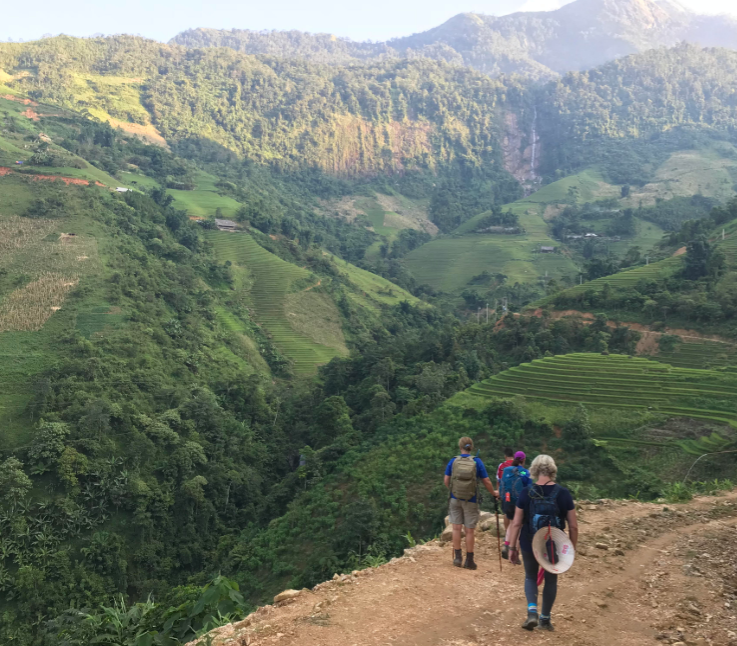 The expedition offers you the challenge of trekking through some of the most beautiful and un-spoilt mountain regions in the world for an amazing taste of South East Asia. Flights depart from Heathrow Airport and arrive in Hanoi where a private transfer will take you directly to the hotel. The following day you have time to relax and enjoy Hanoi before taking the deluxe night train to Lao Cai to start the trek. 5 days of beautiful Vietnam trekking then follows staying in a mixture of local lodges, family houses and hotels. The route travels via the ‘Silver Waterfall’ and through the valleys and mountain passes of the magnificent Hoang Lien Son Mountain Range. Contoured Paddy rice fields and un-spoilt rainforests are among some of the trekking highlights as well as a local school visit and plenty of time to speak with and see the varied lifestyles of the local people. At the end of the expedition will head back to Hanoi on the night train and have another night in Hanoi before flying back to the U.K.
Day 2 Arrive in Hanoi at 11:40 local time and private transfer to the Hanoi Tirant 4* hotel, check-in and time to relax. Day 3 Full day to explore Hanoi and evening transfer 20:30 to the night train to Lao Cai. Breakfast is included at the hotel and you need to check out of your rooms by midday. You may leave you bags at the hotel and the guide will collect the group from the hotel at 20:30 in the evening. The ‘Dream Express’ Train has been booked with private cabins for the group. Breakfast included. 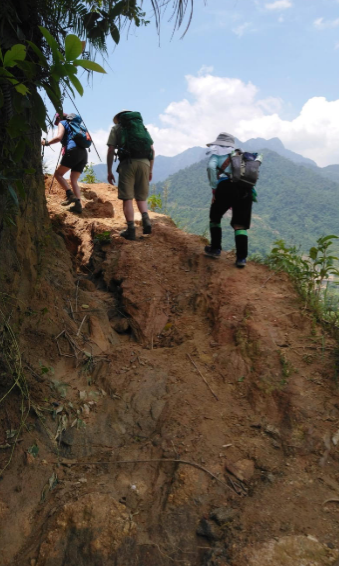 Day 5 Visit Muong Hoa valley After breakfast at the hotel your will leave Sapa by car southwards to Muong Hoa valley and will start trekking from Ta Van village. The scenery is amazing with beautiful views as you gain height towards the unspoilt Hoang Lien Son Park, this area is full of tall trees and fantastic bird life. After lunch, the trek winds its way through an area of the nature reserve and onwards to the isolated village of the H’mong. Here you will have time to relax and enjoy watching everyday life activities before arriving to our camp site next to the river away from the village. In the evening your guide will brief you about the next day trek and you enjoy dinner around the camp fire. Approximately: 12 km of trekking in about 6 hours. Home stay accommodation with breakfast, lunch and dinner included. Day 6 - Visit Ta Trung Ho village Today the birds singing will wake you up in the morning. Breakfast, packing and then we hit the trail! Following a narrow route through the thick rainforest for a couple of hours here you will cross suspension bridges before the view suddenly opens up to a wide valley with beautiful terraced of rice paddies. You then approach to Den Thang village of Black Hmong around noon and lunch. 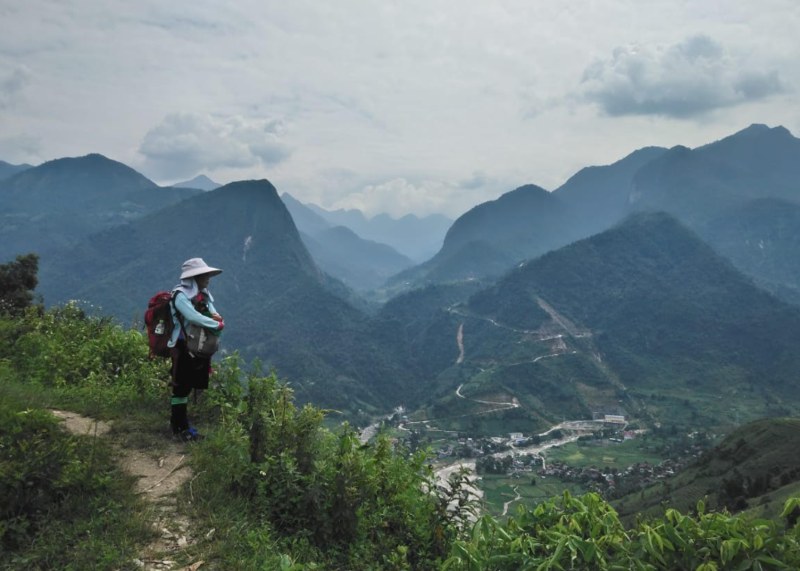 In the afternoon your trek heads up to Ta Trung Ho village where you and your guide can spend the late afternoon walking around the village, visiting homes and talking to the Red Zao people where you will discover a unique culture and way of life. Dinner and stay overnight in the traditional house of a Zao family. Approximately: 10 km of trekking in about 5/6 hours. Home stay accommodation with breakfast, lunch and dinner included. Day 7 - Visit the Thanh Phu village of Tay minority Saying goodbye to our host, you are now on the trail again! The route follows the fringe of the rain forest of the Hoang Lien Son Mountains, ascending through forest and terraced rice paddies and corn fields to Nam Toong. Here lunch will be prepared in a local school where you can chat with the teachers and play games with the children – they always appreciate trekkers as this improves their English language skills and they are very keen to learn new things. The trek then continues in the afternoon by descending the valley and on to Thanh Phu village. The villages here farm rice and have built their large wooden houses on stilts. Tonight we stay at the Topas Ecolodge. This is a small hotel situated on a beautiful hilltop deep in the mountains of Hoang Lien National Park. They have 25 mountain bungalows all with a private balconies that enjoy the magnificent view of the towering peaks and endless valleys and villages. Approximately: 12 km of trekking in about 6 hours. Accommodation is in the 4* Topas Ecolodgee. Breakfast, lunch and dinner included. Day 8 - Visit to Ban Ho- another large and fantastic Tay village – Hanoi Today is an easier day starting with a descent down to the valley from Thanh Phu and the banks of the river which runs through a large and green valley. Enjoy swimming and relax by the river before paying a visit to Ban Ho, another large and fantastic Tay village. Enjoy a long break for lunch in a Tay house and then take a jeep ride back to Sapa. The afternoon is to freshen up before leaving Sapa for Lao Cai station and the night train back to Hanoi. Approximately: 7 km of trekking in about 5 hours. The ‘Dream Express’ Train has been booked with 4 private twin berths cabins + 1 private 4 berth cabin for the group. Breakfast, lunch and dinner included. Day 9 Arrive in Hanoi When the train arrives back in Hanoi (approximately 05:30) the tour guide will collect the group and transfer you to the hotel. You can then leave your bag at the hotel and explore Hanoi stopping where ever you wish for breakfast. Check in is at 2pm (or earlier if the rooms are available). The full day is set aside to relax and explore. The Hanoi Tirant 4* hotel is booked with 4 deluxe twin rooms and 3 deluxe single rooms. Day 10 Breakfast included followed by a guided transfer to the airport to fly back to the U.K. Flight departs at 12:35pm local time. Day 11 Land back in the UK at London Heathrow terminal 2 at 07:45. We provide all the group equipment like tents, tables, chairs, crockery and cutlery but you will need good pair of walking boots for ankle protection and normal walking clothing. We provide a detailed kit prior to departure and run through the kit details in the training day with lots of advice. All our expeditions are ‘all inclusive’ this means that the cost covers all the accommodation, flights, flight tax, transfers, guides, porters and cooks + all food throughout your expedition. The price also covers the training day. The only costs not included are VISA’s (£25) travel insurance, tips, lunch, dinner and drinks in Hanoi – giving you’re the freedom to explore. The cost of the trip is £1,995 There is a £250 trip deposit (non-refundable) to book your place and the remaining balance is paid in small instalments.